Marked down from $75.00 !! Ordinarily sold for $75.00, this piece is marked down to $50.00 to celebrate her life and talent! 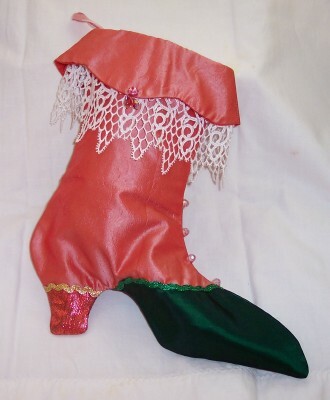 Green and Rose-Pink Embossed Silk outside, Fully lined in red satin inside and trimmed with Elaborate Lace, christened with crystals and jewels. 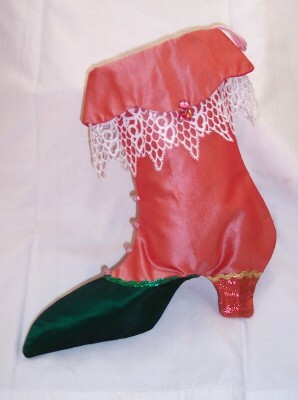 Item is 10 1/2" wide X 10 1/2" tall, with a pink velvet loop for hanging by your chimney. 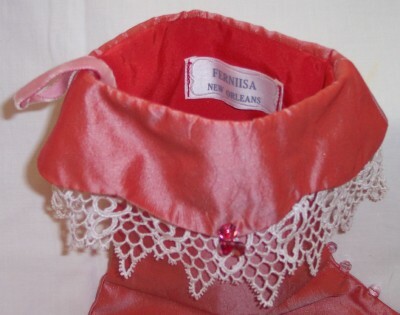 At $50.00, Do not miss this Unique opportunity to own an original Lyn Carroll, Ferniisa Victorian Boot at this great price!